Engines produce vacuum and over the past 120 years engineers have contrived ingenious ways to harness its power to the engine’s induction system. Through a labyrinth of small-bore drillings in the carburetor, the vacuum draws a potent mixture of air and fuel. So formidable is the mixture, it empowers naturally aspirated full-bodied 500cu in race cars to speeds in excess of 213mph in a distance no greater than 1,320 feet! Although its fumes ignite, gasoline won’t burn and produce energy in an internal combustion engine in its liquid form. Instead it needs to be emulsified (mixed with air), atomized, (separated into fine particles) vaporized (transformed to a gaseous state) and compressed in order for it to produce energy. The carburetor takes responsibility for the emulsification and the atomization processes while the vaporization occurs in the induction tracts. 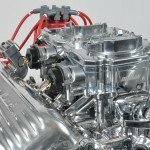 In addition, the carburetor must meet the air-fuel ratio requirements of the engine.To emulsify the air and fuel, small-bore drillings are placed in the air entries on the top of the carburetor. They are known as air bleeds. The emulsified mixture is then drawn rapidly through a multitude of small passageways and distributed into the fast moving air stream in the carburetor’s throttle bores for atomization. It is discharged through a dozen small ports, three in each throttle bore. They are known as idle, transfer slot, and boost venturi. The idle discharge ports and transfer slots are located in the throttle bores of the base plate and draw their source of fuel from the fuel bowls via the carburetor’s idle wells. The boost venturii and their discharge ports are positioned near the top of the carburetor and discharge into the narrowest part of the upper throttle bores. Boost venturii draw their source of fuel from the fuel bowls via the main wells. 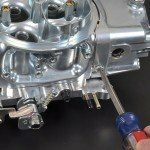 In the following text and sequence of pictures and captions we identify some of the chief components of the modular, square-bore carburetor, illustrate their functions, acquaint you with common problems that can arise, and tell you how to prevent them. 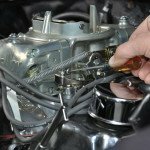 The number one cause of carburetor troubles is the over exposure of the transfer slots at the idle condition. 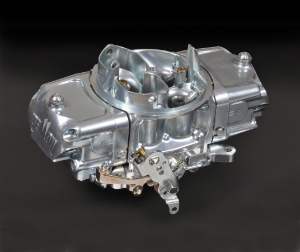 When increasing the idle speed of a four-barrel modular carburetor, adjust both the primary and the secondary throttle blades. If you adjust the idle speed with the primary throttle blades only, you could upset their position relative to the transfer slots. 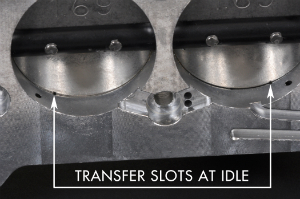 Some of the adverse effects of an over exposed transfer slot at idle are hesitation, excessive richness, or poor running; it can even negate the idle circuit completely. In the idle condition, when the throttle blades are closed, the transfer slots should give the appearance of a small square when viewed from underneath the base plate. The Idle-Eze was created by Demon Carburetion chiefly to ease the complications associated with idle-speed adjustment. This device can introduce an extra source of idle air to the engine without disrupting the critical relationship between the idle-speed adjustment screws, the throttle blades, and the transfer slots.The Idle-Eze has access to air above the throttle blades and can transfer it beneath them, if necessary. This introduces an extra source of air to the engine that can alter the idle speed by as much as 500rpm without touching the idle speed adjusting screws. 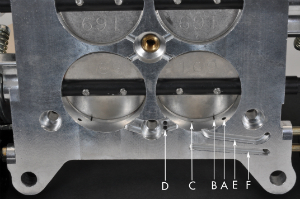 Set the idle mixture to the highest vacuum by using a vacuum gauge connected to the constant-vacuum port of the carburetor base plate. Slowly adjust the first idle-mixture screw. Make one adjustment only to the first screw. The adjustment should be no more than an eighth or quarter turn. Then leave sufficient time for the carburetor to respond and move to the next adjuster screw. 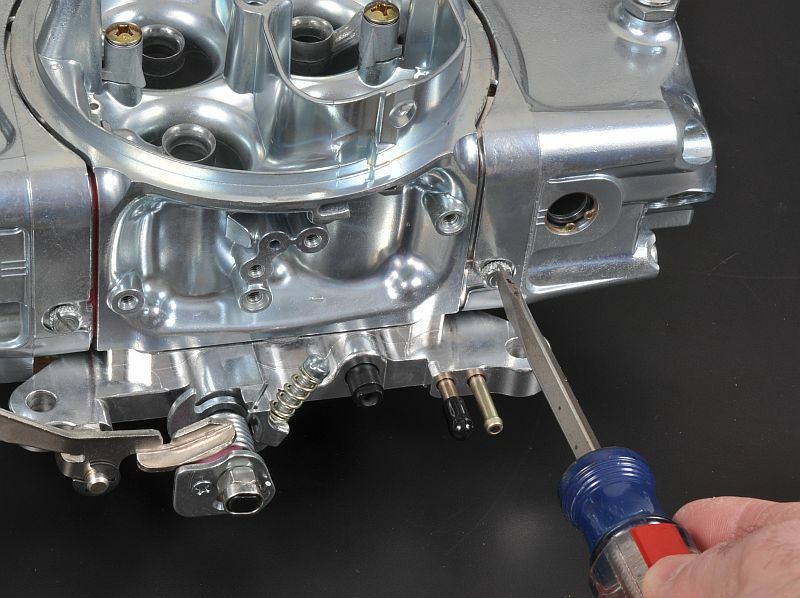 Gradually work your way around the carburetor, making just one, small, slow adjustment to each screw. After setting the idle mixture, it’s time to check the float levels. With the motor running the fuel level should be in the middle of the glass window of the fuel bowl. If it isn’t loosen the lock screw on top of the bowl and adjust the nut clockwise to lower the float level and counter-clockwise to raise the float level. Make the adjustment by one flat of the nut at a time and wait until the carburetor has had a chance to respond. Installing larger pump shooters often eradicates a hesitation at off-idle, but frequently the fault lies not with the pump shooters at all but with incorrect ignition timing. There are at least two ways of reaching the off-idle position, either gently or suddenly. If the throttle is eased into the off-idle position and the motor stumbles, the idle circuits and the transfer slots are probably too lean. To cure this condition either slightly undo all four idle-mixture adjusting screws to enrich the system or enlarge the idle-feed restrictors in the metering blocks. On the other hand, if the hesitation occurs under rapid acceleration increase the size of the pump shooters. The pump shooters only serve to provide the initial shot of fuel and together with the idle circuits and transfer slots they provide the predominant fuel supply to the motor until the main circuits are operating through the boost venturii. The pump shooters are also particularly useful during cold starts. One or two depressions of the throttle pedal provide sufficient fuel for starting. A variety of orifices are available, ranging from 0.025in to 0.052in. Usually larger engines use larger orifice pump shooters. Replaceable high-speed air bleeds aid in tuning the fuel curve. These tiny bleeds work in conjunction with the main jets, emulsifying the air and fuel. The smaller the air bleeds the richer the mixture, which is the opposite reaction when compared with main jets. 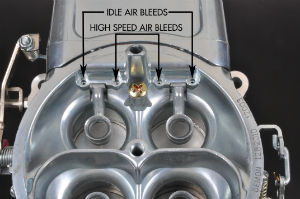 As air bleeds are reduced in size the carburetor draws more aggressively and adds additional fuel. But installing incorrect orifices in the air bleeds bring you bigger trouble than their jet sizes. It pays not to touch them unless you have access to a dynamometer and can analyze the test results. 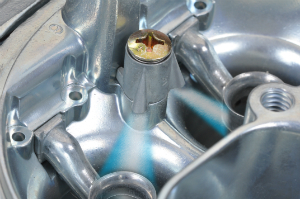 Problem: Over exposure of the transfer slot at idle is the chief cause of carburetor troubles. Solution: In the idle condition the transfer slots should give the appearance of a small square when viewed from underneath the base plate. The Idle-Eze was created by Demon Carburetion to ease the complications associated with idle-speed adjustment. 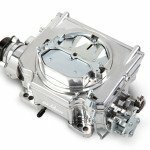 This device can introduce an extra source of idle air to the engine without disrupting the critical relationship between the idle-speed screws, the throttle blades, and the transfer slots. With the throttle blades slightly open, here are the principal players in the carburetor’s base plate. 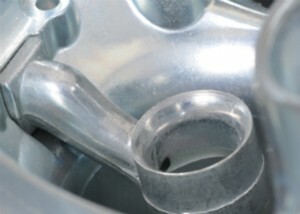 A) The idle discharge ports operate under the throttle blades—one in each port. At idle, when the throttle blades are almost closed, the vacuum created by the cylinders causes low pressure in the induction system and activates the idle circuits. B) At off-idle as the throttle blades begin to open, they uncover the transfer slots which begin to issue fuel, supplementing the discharge from the idle circuits. Both idle and transfer slot fuel circuits continue to maintain their output long after the boost venturii have activated. The boost venturii begin their discharge as the throttle blades open wider. As the furious rush of air travels past the boosters, it creates a low pressure area, which causes them to draw fuel from the carburetor’s fuel bowls via the main wells. C) This small orifice located in one of the primary throttle bores is not readily visible when the throttle blade is closed. Connected to the slot F its purpose is to transfer vacuum via a small-bore hose to distributors that operate a vacuum advance mechanism. 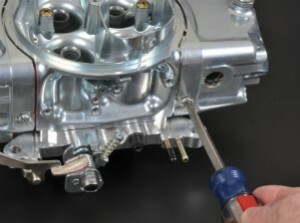 As the throttle blade opens, it uncovers this port and exposes the distributor to vacuum during cruising and light throttle openings. 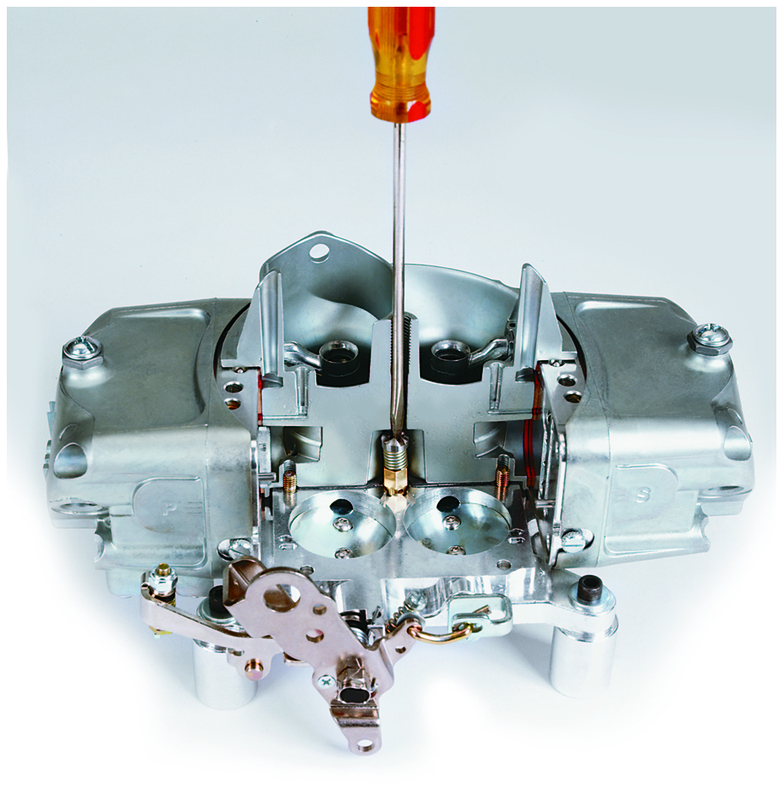 Modest increases in ignition timing during light throttle openings improve the engine’s efficiency. D) These ports are related to the power valve circuit. The power valve, which is closed at idle, adds fuel when the vacuum drops beneath its rating. It contributes to a cleaner idle circuit and reduces main jet orifices by around 8 or 10 sizes. E) This constant vacuum port can be used for numerous functions, including taking vacuum readings while adjusting the idle mixture. 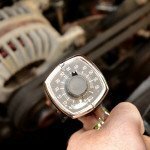 Using a vacuum gauge, adjust each idle-mixture screw to its highest value. Keep moving around the carburetor, adjusting each screw an eighth to a quarter turn and waiting for the carburetor to respond. The accelerator pump shooters dispense their blasts of fuel through two orifices, aiming their discharge at each outer ring of the boost venturii. This technique is used effectively to provide increased fuel supply for acceleration purposes and for cold starting. The air bleeds draw air into the idle fuel wells and into the main fuel wells where it emulsifies (mixes) before being discharged through the idle ports and transfer slots in the base plate as well as the boost venturii up in the carburettor’s main body. The boost venturii are carefully positioned in a choked area, an area with a reduced cross-section to increase the air speed. Increased air speed lowers the air pressure at the small discharge orifice in the booster, drawing out the air-fuel mixture into the air stream on its journey to the cylinders.